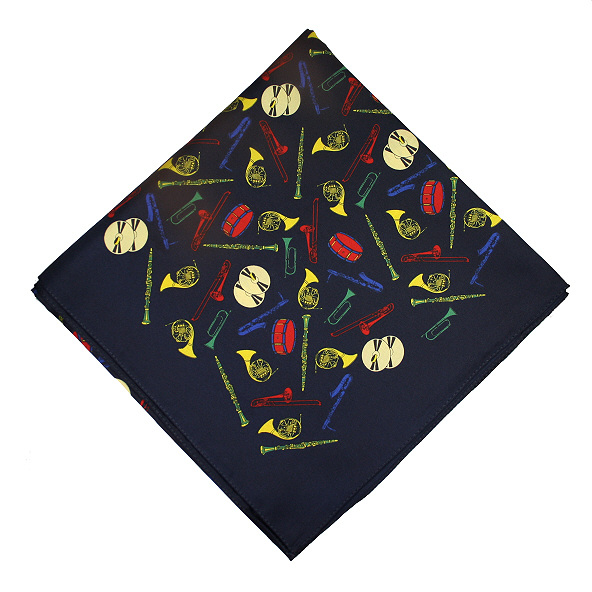 A soft, square music scarf picturing various musical instruments including cymbals, drum, French horn, trumpet and more on a dark navy background. A beautiful music scarf with silver notes on a dark turquoise background finished with a fringed edging. An elegant cream music scarf with navy blue music notes on a two tone background. A pair of gold plated novelty keyboard cufflinks. Black onyx and mother of pearl detail. A fun, music tie with piano keys and music notes running down the length of each side of the tie. Made from pure silk.